Please join us Thursday March 20th as we honor and celebrate the life of Sam Lacey. Visitation will be held 10am to 3pm at Watkins Heritage Chapel 4000 Emanuel Cleaver II Blvd Kansas City, MO 64130. There will be a Memorial Tribute Service held at The Loretta Building in Kansas City from 6pm to 8pm 1111 W 39th St Kansas City, MO 64111. There will be additional services in his hometown of Indianola, MI and we will update as these services are arranged. In lieu of flowers the family has requested donations to Sam's Memorial Fund. I want to thank all the generous friends and family that have donated in the memory of our father Sam. Our family thanks each and every one of you from the bottom of our hearts. He has touched many lives and left lasting memories that we will all cherish for years to come. I would like to thank everyone who came out to support Big Fella and his family yesterday. It was extemely tough but we got thru it. Rough days ahead but we'll keep praying. If you are making donations, make checks payable to Calvin Thompson and in the memo line put "Sam Lacey Memorial". RIP Big Fella! I am so sorry to hear of Sam's passing. AGGIES of our time, were proud of our basketball program and players...sweet memories of our very own winning team. Rest in Peace, Sam. I was Coach Lou Henson's secretary in the Athletic Dept. when Sam Lacey played his college ball at NMSU. He was a gentle giant, outstanding athlete role model, and my kid's favorite. My daughter who was 10 yrs. old at the time, traveled with us to the Final Four in 1970, and Sam held her hand as the team and staff were given a VIP tour of the White House. She has never forgotten that. We will never forget #44 and all the joyous memories of watching him play basketball! Rest in peace Sam Lacey, and say "Hi" to my Mom who was also a big fan of yours! I was saddened to hear the news of Sam's passing… I met Sam in the summer of 1970 when I was a 13 year old kid at Bob Cousy's basketball camp in New Hampshire. 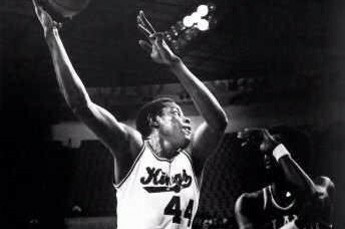 He had just been drafted by the Cincinnati Royals and showed up at the camp to work out before the upcoming season. I spent two weeks being his "rebounder". I helped him work out every day while he worked on his jump shot. For a man of his size, if you didn't know him, you could easily be intimidated by him. I'll never forget what a kind, gentle man he was. I followed his career in the NBA and will always hold him in high esteem. To his family, I'm sorry for your loss. RIP Slammin' Sam. Sam & Jimmy Collins are part of the reason I went to New Mexico State. That Sports Illustrated cover & story about the 1969-70 Amazin' Aggies caught my 12-year old eyes and the beautiful background of White Sands Missile Range. I met Sam when I worked for the KC Royals and we stayed in touch off-and-on. I'm so thankful we saw each other in January when NM State was in town to play UMKC. We planned to meet for lunch, but never did. A huge regret, for sure. Rest in peace, Lacey. From one Gentry H.S. Ram to another. Class of 1966. He was a good man and good neighbor. Sam is the first Aggie player I can remember watching and I have admired him ever since. My condolensces to the Lacey family. Once an Aggie, Always and Aggie! Looks like God has drafted you early and he made a damn fine pick. For a kid from humble beginnings and gentle ways, you brought so much joy to so many. We will miss you and miss all the times the ball to the hoop for NMSU. God bless you and your family.